When China announced on January 12, 2010 that they were going to raise reserve requirements by 50 basis points everyone broke out in a panic about it. People speculated there would be crashes, that that there was a crazy China bubble or that the Chinese banks were driving asset-price bubbles through insane leverage. 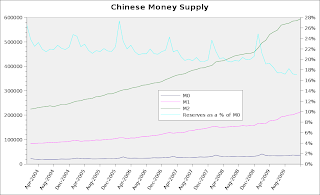 While the Chines Money Supply has indeed been growing faster than before as of late, that makes sense. Last year assets were depressed, leaving room for upside, and credit was hard to get. The Chinese central bank dropped reserve requirements by 50 basis points, which encouraged lending. As things settled down people resumed lending and borrowing. Nothing really crazy is going on. If you are part of the Minsky club, like I am, you consider a significant credit boom an essential part of a bubble. So, let's see if there really is some crazy Chinese bubble or if the Central Bank was just returning things to normal. Please also note how high their reserves are. American banks keep only 10% of reserves on their transaction deposits (checking accounts). Savings accounts, and CDs are time deposits and have no mandated reserve requirement. Do your homework people. It's not that hard.